Water produced by the Elix Advantage system meets or exceeds Type 2 water quality (corresponding to analytical-grade water) as defined by ASTM®, CLSI® and ISO® 3696/BS 3997. Elix Advantage System water also complies with the purified water requirements from the US, Japanese and European Pharmacopeias. The Elix Advantage system provides consistent, reliable pure water—saving you time and money. 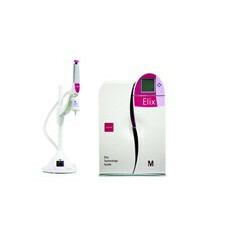 Combining Millipore’ s patented Elix electrodeionization technology with the most advanced purification technologies, the Elix Advantage system uses potable tap water as feed to produce consistent, high-quality pure water for all your lab’s needs. The system provides pressurized, bacteria-free pure water through the E-POD (Elix Point-of-Delivery) units. The compact water production unit is adapted to laboratory space constraints and can be installed on the wall or under a sink, saving valuable bench space. The exceptional ergonomic design of the E-POD allows for manual or volumetric dispensing of pure water to fill a variety of laboratory vessels (up to a 5 L Erlenmeyer flask or 20 L carboy). Millipore filtration devices collect and prepare samples, mobile phases, and buffers to obtain the highest quality results. Find laboratory water filters for sale and auction at LabX.